Energy rates are high and continue to rise. Photovoltaic produces renewable and clean electricity for your property at minimal cost. Save money now and lock in lowered rates with a system that operates for 25 years! Solaron is an experienced photovoltaic installer, and we only use SunPower photovoltaic panels, guaranteed for 25 years of life. This makes for a winning photovoltaic combination for of our clients in Loomis. In addition to saving you money from day one, investing in photovoltaic is the right thing to do for the future! As photovoltaic power produces electricity without burning fossil fuels, it’s most certainly the way of the future. So it’s the right thing to do for your planet, wallet, family and future! 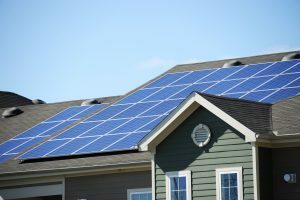 How else can Solaron make photovoltaic more affordable? By means of continuing incentive programs offered by municipalities and governments! As these vary based on your specific address and power provider, talk with a Solaron sales rep today to learn about these potentially significant savings!